Q: Take the four-letter men's names TODD, OMAR, DAVE and DREW. 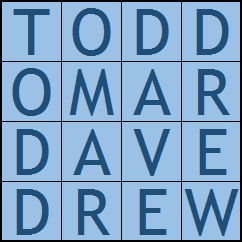 If you write them one under the other, they'll form a word square, spelling TODD, OMAR, DAVE and DREW reading down as well. Can you construct a word square consisting of five five-letter men's names? Any such square using relatively familiar men's names will count. Will has an answer using four relatively common names and one less familiar one. This list of 5-letter names or this list of 5-letter boys names should help you get started. Nice! Added to the original post. That list has just boys names and includes popularity. Are your names in the lists above? I hope your hint isn't a misdirection. Rob - That description fits the answers I've got. With my blog tile one would think I'd have no problem with this puzzle...keep thinking. A letter analysis of the five-letter male first names in IMDB's actor database reveals that letters overrepresented in these names (compared to standard English text) are (in order) K, Y, J, M, R, L, and B, and underrepresented letters are T, H, W, C, and P. That is, compared to the standard ETAOINSHRDL… letter frequency, these names have a frequency of AIENROLSMTYDKHUBCJGVPFZWXQ. In this analysis I excluded names that appeared less than four times, which pared it down from about 21,000 uniques names to about 4,600. Here's the raw data, sorted by frequency counts. Then one needs to cull the female names. What? No, the list is pulled from IMDB's male actor list. That's already done. I can't help but think that your time and talents might be better spent trying to hack into the 上海证券交易所. On the other hand, maybe you're already doing that, and you only visit here for the amusement value. In any case, Happy New Year, PC! You may have to copy and paste this link, titled on TYWKIWDBI : "Trump administration heads toward Washington," but I think you will like it. I copied and pasted and all I got was a picture of a train on fire? I want my vote back! Actually, I'd probably cast it the same way, so never mind. I did the best I could. Maybe it's the new year, but I thought this one was rather tough. I have no interest in spending my time on this puzzle. Oh, and regarding this week's puzzle, I agree with SDB. Not the way I want to spend the initial hours (or days) of the new year. When solved there is no reward, such as, "Oh, I never realized that!" Or anything worthwhile at all, just that a tedious exercise was solved and nothing learned in the process. Great way to begin what promises to be a really crappy new year. After spending the whole day on this, I have a solution with 4 good names and 1 name that is so obscure I can find only one person on the interwebs with this spelling. Well, Will is asking a yes/no question. Can you construct a word square using 5 relatively familiar men's names? The correct answer might be "no". Bonus points if you can also make it a palindrome, like the Sator Square. No Sator answers with halfway recognizable names. My database creates a total of two Sator squares, but on closer inspection each contains one or more names that are more traditionally female. I guess there are technically men with those names, but it wouldn't hold up in the court of puzzle opinion. Like others here have said, I don't like word square puzzles and never try to solve them. Waste of time. Ooh, I like my chances this week. PC: Sounds like you had another exercise in computer programming. My idea of an acceptable solution would be if all 5 names were in the top 250 (or so) list of modern men's names. Any luck?? I wrote a little awk script to solve this one. The two lists that Blaine mentioned at the top contain 870 unique names between them. Now, no one should claim that all 870 are common (or even men's names at all), but using those, my script found 253 valid 5x5 squares. (Oddly, the first one found includes the name "Blane".) None of the squares uses 5 common male names. The hard part will be deciding which is the most reasonable one to submit. I am not working this one, but before I got outta bed Sunday I thought of Blaine as a possible starting point but quickly realized it was six letters. Jan: I'd be interested in seeing your script (after the deadline, of course). Thanks. I stopped doing the laundry this weekend after I threw in the towels. If Michael Jackson had adopted another child after Blanket, he very well may have named him Towel. Or, perhaps Blanket will change his name to Towel when he reaches adulthood. What a messed-up childhood he must have had. Just imagine all the crap he had to absorb. Poor Blanket has apparently already changed his name....to "BIGI". I looked it up. How many folks here are fans of Sudoku and/ or KenKen? And can you explain the attraction? Never do Sudoku or xwords. Never heard of KenKen. I always thought it was KenBarbie. Can you explain the attraction of crosswords or acrostics or the NPR Sunday puzzle or the CarTalk puzzler. I guess it's like a computer in an idle loop: it's always doing something, just not always something useful. I cancelled our local newspaper subscription over a month ago. The paper has been getting smaller and smaller with very little substance. The biggest thing I miss is the daily NYT Crossword. I may just get a subscription to it instead of the paper. I often argue that we should scrap our subscription to the paper New York Times. A couple of weeks ago, I was glad that my wife prevailed. The Times included a big 30-plus puzzle bonus holiday insert, including a massive 50 x 50 crossword. It felt like a gift from Will, and was much appreciated. Jan: I've been doing crosswords for decades; I suppose traditional crosswords test your knowledge of various trivia, sort of like Jeopardy(!). Acrostics also have additional use of wordplay/ puns/ anagrams, etc. But I don't get the attraction to the Sudoku/ KenKen, the answer is always some combination of 1-2-3-4-5-6-7-8-9-0, not necessarily in that order. You could argue the same for crosswords (a-b-c etc) except those create elements of common knowledge, which is really all words are, and/ or create clever reuses of language. By the way, the digital subscription to the NYT does include all their crosswords, you get them the day before, and you can use a timer to compare yourself to others. Though I think the fastest times are people who figure out the entire puzzle in advance, and spend that 90 seconds just filling in the blanks. I must confess I am still clumsy in filling out the digital squares. As I make one final and desperate attempt to solve this, I keep looking ahead to how to notify NPR of my 'winning' answer. My first idea is to send the answer in by courier. After all, it is the most secure way, isn't it? See the end of this week's post for another transmittal method for your answers. WW - I like it, that's pretty good!! Maybe DT should stay up late with a chisel & tablet instead of twitter. BTW, I liked your live stream video from last week! Thanks, 68Charger. Luckily, many more live streams to come. Yes, anything but twittering away the early hours of the day. . .Could casting things in stone make him stop and think a bit? Cune-IForm overtaking the IPhone? I finally did get an answer for this puzzle. Four of the names are on both lists. The fifth, while not on either list, looks and sounds valid. My answers may not be elegant but it seems to work. Speaking of Word Woman's (who is aka Scientific Steph) fine Partial Ellipsis Of The Sun (PEOTS) blog (to which she linked, above), those of you who are still struggling with this week's NPR challenge may want to check out an early-2014 blog from the PEOTS archives. It offers an excellent boy's first name that I cannot find on any other internet name list! I have not yet solved Will's puzzle by using this somewhat unusual name, but I am working on it. Thanks for that memory, Lego. Your next-to-last comment on the link above is classic dialogue that still makes me laugh, lo, these nearly three years later! Guess good humorous writing just gets better with age. Btw, I saw this fine young man at the library recently. He's in middle school now. No one ever forgets his name! I guess it's akin to the name-remembering technique of say, picturing a "Jim" in a Jungle Gym. The 5-letter boys' name story/hook is built in to his every introduction. I have 4 answers, each one using 4 names on the lists and the fifth one obscure. One of my 5th names is KAREL, relatively common but not on either list. I will post tomorrow, but I am unable to post until around 3:00 pm EST. Make that 6:00 pm EST. A good name for Xmas time I suppose. He could go Kareling. But who really Kares? I never heard of this name and hope not to in the future either. The Czech writer Karel Čapek fits the bill; he is best known for bringing forth the term "robot" in his play R.U.R. (Rossum’s Universal Robots); robot was actually created by his brother Josef. SDB - you might enjoy reading about this Karel, he was a strong anti-fascist and Nobel nominee 7 times; he died before the Nazis could arrest him. I guess were he alive today he would not be a fan of Gingrich. I think if he were alive today he would not be a fan of the US. Except he'd like how we've all become robots. .....willingly marching to the showers. I wake up thinking these are the last dying gasps of a structure that is collapsing under an infection of its own lunacy. And as often happens with a dying person, it is going through violent seizures as it tries in vain to cling to life/ power. This is not just from the party of Lincoln, the party of Clinton has done its share. When I'm in an optimistic mood I can see the rise of a more mature and humane state; unfortunately I'm not optimistic very often, and usually see this dying behemoth metastasizing into something more venal or taking out a lot of innocents with it. Since November 8th I awake each and every morning with the overpowering feeling I am awaking into, not from, a nightmare. I now have a hard time motivating myself to arise to a new day, just to see all I have worked for to slip further and further away. I tell myself I of all people I know should be able to deal with this because I have been warning of its impending for many years now. No! It does not help. I always prayed I was wrong, but knew I was not wrong at all. This country was based on a series of lies and criminal actions that caused the deaths of hoards of innocents and shows no signs of stopping this villainous behavior. Now we are also determined to destroy ourselves. The majority of its people are not going to be bothered with paying more than scant attention as long as they are convinced their infatuation with greed is still seeming to be a worthwhile goal within their reach. If and when they ever do wake up it will be far too late for it to matter. Growing up in the fifties was strange. Not only did we have to put up with McCarthyism, but we also had to pretend to be afraid of the Bomb. But then on the other hand we always had something to laugh at, such as when the popular TV show, "Leave It To Beaver" first aired. It almost caused an international incident with Canada because so many Canadians thought it was an intentional slur on their country. And calling the jingling of change in their pockets "Loonie Tunes" sealed the deal? And here is the awk script I used. Awk is a text processing language that's included in Cygwin, a free package that provides a Unix-like environment for Windows PCs. All my beautiful tab indents got eaten! Oh, well. Dam chewzy of them too! I say "Hats off to 'em." Been saving that all week :-). Funny, the "dent" in "indent" and "rodent" has the same toothy origin. Along the same (von Ebner) lines, see Word Woman's latest blog post. How about those word origins (said with a toothy grin)?! Thanks for the link to PEOTS, jan.
Eadon is an Irish name and Linda can be a boys name. In fact, Linda was on both those lists as a boys name. An internet checked showed some people do consider Linda as a boys name. Go figure... So, it wasn't the greatest answer but it worked!! That was a tough puzzle. I have heard of all of those names. But, I obviously didn't get the all important call. Oh well! This is the best I can do! Each “word square” has four names from the lists. OK, the last one is not a name, but at least I tried. This was indeed a difficult challenge. But after all this, who knows? Maybe KHYGA will catch on as a boy's name. It sounds African. All valid names per the interweb! Well, if it's on the "interweb" it must be true. Let us not allow critical thinking to get in our way. I can imagine a conversation between Guess, Agree, Roger, Clarence, Victor, Hu, Wat, Idunno, and Yassir, but I'm not creative enough to compose it. Is it really true that Holcomb, Kansas is a Clutter of dead people? I just uploaded this week's Puzzleria! Ten puzzles on our menus this week, including four that Rip Off Shortz. You know the routine... click on the "Joseph Young's Puzzleria!" link on Blaine's PUZZLE LINKS. Unfortunately, "RUMOR", although a common word, is not a name. But that's the most effort I was willing to put into this horrible waste of time. I know there are a number of programmers out there that will write a brute-force script to solve this challenge. And from what I've heard, there is not an answer containing 5 common names. So I guess my official answer to your yes/no question is NO, you cannot construct a word square using 5 relatively familiar names, sorry." It will be interesting to see what the winning answer is. Plus, I'd like to see how many entries, correct or incorrect, there were. Some people on this blog will blubber about just about anything! I'm a little skeptical, a local seafood restaurant was advertising a one week dinner special today. Just curious about the timing of it. SDB - I pulled that post and then I figured the heck with it. After today's headlines I thought we needed some humor, so I reposted it. 68Charger - This is 2017. There is no longer anything that is humorous. According to the frequencies in my name list gathered from IMDB, the best word grid is KEMAL EMILE MILAN ALAIN LENNY. All names are in the top 440 names. But "best" depends on whether the frequencies of names in IMDB is representative of the population. I assume it's a fairly random sample. Also there's a lot of American bias in terms of what we'd consider a "common" name. I had more than the usual amount of fun with the puzzle this week and I thank Will Shortz for allowing this type of puzzle to be featured on Weekend Edition Sunday. FYI I have a file with over 2500 legitimate 5x5 grids of male first names, so if anyone has a friend with a five-letter name and you'd like to know if there exists a word grid with their name in it, let me know and I'll look it up for you. Who knows, could make a nice gift. I think there may be one offering above that meets the "relatively common" standard. Willy better accept any that have a more common name than his least one. I got some things done this week with the time I saved by not working this flop. A friend of mines 4th cousin, Trump Pence IV, (adopted), was tring to get his names to work in a grid but with no luck. He kind of has a big ego, though. I bet he also eats shoots and leaves too. My parents used to take my two younger brothers and me to the Seattle zoo yearly, but we always knew how to find our way back home. Another too easy puzzle about someone known by their middle name.